Mr. Peterson is an active chamber musician, performing extensively throughout Europe and The United States with The Transcontinental Saxophone Quartet, and is currently also performing with the Hard-Bop Jazz Saxophone Quartet in Fargo-Moorhead. The Hard-Bop Quartet's first CD release "DON'T STEP ON YOUR NECK", is available on Sea-Breeze records and the TSQ's debut CD "MOUNTAIN ROADS" is available on Albany Records. Russell's first solo CD "AMERICAN BREATH" is on Barking Dog Records and features the music of David Maslanka, Larry Bell and Peterson. 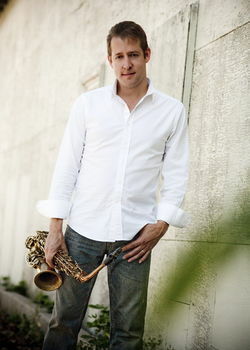 Russell released "Russ Peterson and Friends, Jazz/Rock Saxophone" in Jan of 2010. As an Orchestral player, Russell has served as bassoonist with several symphony orchestras, and is currently principal bassoonist with the Fargo-Moorhead Symphony, as well as bassoonist with t he Fargo-Moorhead Symphony Wind Quintet. Mr. Peterson has performed with some of the most notable artist in the business: Phil Woods, Manhattan Transfer, Dave Weckle, Peter Erskin, Henry Mancini, Gregg Bissonette, Ray Charles, Wayne Newton, Bill Watrous, Gregg Field, Frankie Valie and the 4 Seasons, Maureen McGovern, Samuel Sanders, The Eroica Trio, Will Kennedy, Frankie Avalon, Tommy Igoe, Nick Brignola, Zoro, Ignacio Berroa, Terri Lyne Carrington, the Four Tops. He has been commissioned by the Fargo-Moorhead Symphony to compose a "Concerto for Timpani and Orchestra" which was premiered to rave reviews in April of 2002, including GRAMOPHONE Magazine, (May 2003), 'Peterson playing with great abandon and dazzling virtuosity, the music has a seductive allure and visceral excitement that is more than the sum of its purely musical parts.' A CD of The music of Russell Peterson featuring the Saxophone and Timpani Concerto is now available from the Fargo-Moorhead Symphony. The Fergus Falls High School Band premiered hi band work "The Tornado of 1919" in 2001, and his new chamber works for sax were premiered in 2003: "Sonata for Alto sax and piano" and "Quintet for Alto sax and strings". He premiered his new "Sonata for alto saxophone and Marimbas" with the Concordia Marimba Choir in 2006 at the Concordia Day of Percussion. Russell was commissioned by the Fargo-Moorhead Symphony to compose an opener for the 2005-06 season. "Between 2 Cultures" was premiered on the opening concert in Sept. 2005. His "Trio for Alto Saxophone, Violin and Piano" was premiered at the region 3 NASA convention, April of 2007. Russell's "Trio for flute, saxophone and piano" was premiered in Moorhead, MN in Oct. of 2009 and was performed in Calf. at the Summer 2010 National Flute Association convention, and the National North American Saxophone Alliance Convention in Athens, GA in March of 2010. His "Trio for Viola, Saxophone and Piano" was premiered in 2010 and is now also "Trio #2 for Flute, Saxophone and Piano." His newest piece, "Sonata for alto saxophone and guitar" will be premiered this summer at the 2012 World Saxophone Congress. Mr. Peterson has served on the faculty at Youngstown State University (Ohio), The University of Toledo (Ohio), Minnesota State University Moorhead, The Interlochen Summer Arts Camp (Michigan), The International Music Camp, and is currently instructor of Saxophone, Bassoon ,and Jazz ensemble Iat Concordia College in Moorhead, Minnesota. This page was last modified on 20 May 2012, at 01:55.